All works fine except when opening applications that need GPU acceleration, like Photos. In that situations glitched zones appear on the screen until the application quits. Will upgrading RAM provide more shared memory for the HD Graphics 3000 to access? At this time, after hack the shared memory to the GPU reached 1536 MB, as is shown in About This Mac. Adding extra memory to the system is not going to improve the graphics, I'm afraid. The Intel HD3000 has a hardware limitation of approx. 1.7 GB of system RAM it can use for video ram. So even though you add 8 GB of extra system RAM, you're not going to be able to use more of it for video ram. As far I know it is possible to set the VRamSize to 2048, which would indicate 2 GB - but in reality only ~1.7 GB would actually be used. If you want to try that, please change the x60 in your command to x80, and the VRAMSize from 1536 to 2048. I wouldn't expect that to alleviate the problem with zones of glitches however. 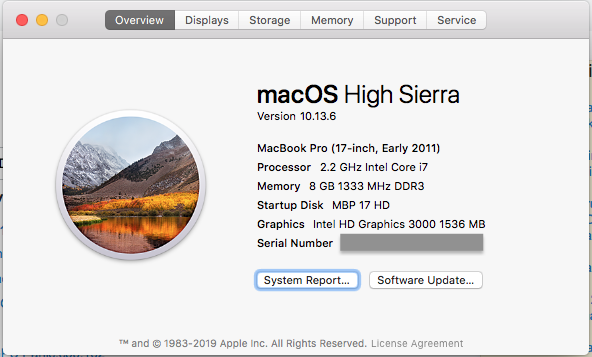 disable failing AMD GPU on a 2011 MBP? from Linux, because of Sierra's SIP?